NOTE: The authors are seeking input from schol-comm practitioners about their roles and responsibilities via this online survey, which closes June 15, 2018. The following is a guest post authored by co-Principal Investigators Maria Bonn, University of Illinois Urbana-Champaign School of Information Sciences; Josh Bolick, University of Kansas Libraries; and William Cross, North Carolina State University Libraries. Sometime in 2016, through a mix of happenstance, initiative, friendly referrals and pure good luck, the three of us began a series of email and telephone conversations in which we puzzled over whether new LIS professionals are being adequately prepared for roles in academic libraries in which they will support scholarly communication in all its permutations. We are each engaged in such work and bring different perspectives and experience to it, from the trenches of our present and past positions, as instructors, as recent students, as job applicants and hiring committee members. It is increasingly evident that awareness, proficiency, and even fluency in scholarly communication issues is central to the work of academic librarians across institutional type and department. Academic library job postings calling for scholarly communication specialists — or at least for candidates who are well versed in those issues — have been steadily accumulating for some years now. LIS curricular offerings, however, haven’t yet evolved with this shift in the market. Reflecting on this and on conversations with our colleagues, our strong sense is that most new librarians are not well-versed, or even versed at all, in the skills that support scholarly communication: understanding copyright and fair use, open licensing, academic publishing norms, the complexities of peer review, the emergence of open education and data management as focus areas, and so on. Why the skill and education gap? The lack of scholcomm offerings in LIS programs might be due in part to LIS faculty not being themselves comfortable with the contemporary skills needed to navigate the complexity of scholarly communication. There’s also no core educational resource dedicated to developing such skills, no common text that covers scholarly communication as a wide-ranging and rapidly-developing field. This presents an opportunity, so we began to consider the design and development of an open educational resource about scholarly communication librarianship, through which we hope to make a meaningful intervention in our field. With the generous support of IMLS, we have undertaken a research project to learn how scholcomm workers understand and articulate the practice of scholarly communication librarianship and how we, the community of practice, might have a larger role in preparing our future colleagues for scholcomm work. This research has been underway since the beginning of 2018 and continues apace. While gathering input and data on stakeholders like LIS faculty and students is extremely important, we always knew that we would be best informed by the perspectives and experiences of our community of practice, by hearing from those who do the everyday work of partnering with and supporting scholars who are the primary agents in scholarly communication. So, as we library professionals do, in early April we had a meeting (agenda). We brought together almost forty folks with significant experience and investment in scholarly communication, from high-level administrators to new scholarly communication librarians in the first few years of their careers. 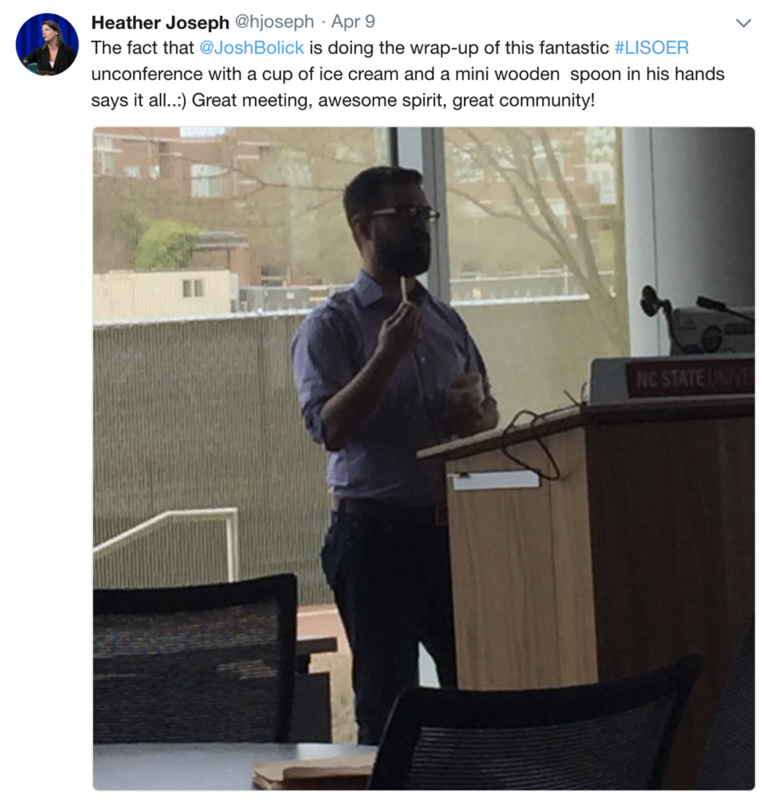 We gathered in the open, pleasant spaces of the Hunt Library at NCSU and over conference tables and tacos and on whiteboards and sticky notes. 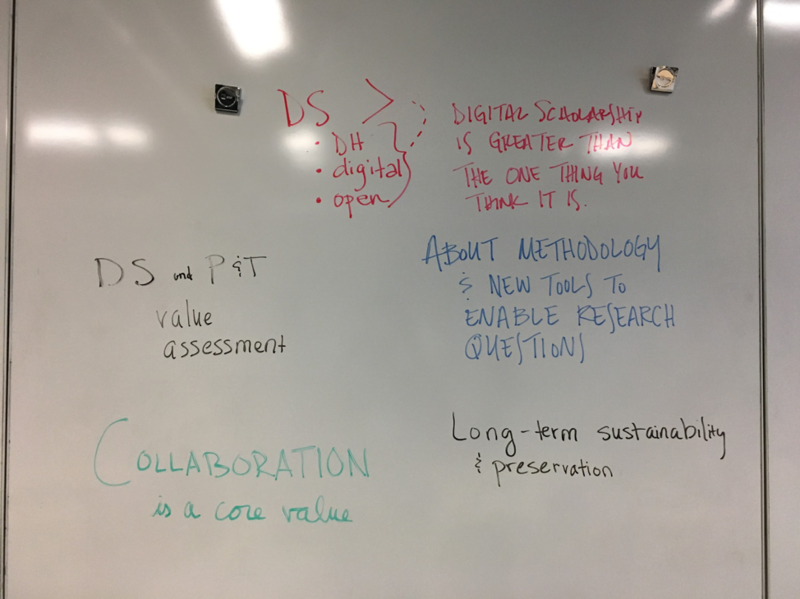 We worked together to define the skills, values, and the stakes of scholarly communication and how to best infuse those through the library profession. We shared experiences, frustrations, ambitions, and ice cream. These two days of effort scoped the content, audience, and purpose for an OER of scholarly communication librarianship. There were few quiet moments and no dull ones. Arising from the rich experiential base in the room were stories that provided practical advice, words of warning, and visions for a future in which the academy supports its members in developing and managing scholarship that has broad impact and social benefit. We discussed data management, scholarly identity, metrics of all types, varieties of licensing, mechanisms for open peer review, building prestige for library based publishing, how social justice intersects with these things, and so much more. Invited participants Sarah Hare, Ali Versluis and Lillian Rigling generously put their experience and intelligence together before the unconference and created a design thinking workshop that inspired and directed us all in building learning objectives for our proposed OER. Amidst this variety, themes emerged and became threads that tied the conversations together. Kevin Smith, Dean of Libraries at the University of Kansas, and Heather Joseph, SPARC Executive Director, opened our conversations by calling for those of us who work in scholarly communication to get better at telling our stories, at sharing in a compelling way, what we do and why it matters. Storytelling was a fulcrum of the two days. Sometimes we need to tell stories to our scholars, sometimes to our university administrators, or to our colleagues in the library, even to our friends and families. Whomever the audience, we need the language and evidence that make a compelling case for our work. We frequently came around to reminding ourselves that are many kinds of stories to tell — as many stories as there are scholars — representing all kinds of personal, institutional, and disciplinary identities. These stories facilitate connections, creating shared understanding and goals. The importance of these connections, of relationships, was another leitmotif of the meeting. The importance of soft skills which are central to developing rewarding relationships, such as confidence, empathy, and a sense of timing, loomed large. For the library community to maximally support scholarly communication, it must do so in the context of a web of relationships, with scholars seasoned and new, with policy makers and government officials, with university administrators, with colleagues at one’s own institution and within a community of practice, and with a public that increasingly may not understand what we do, what value we add (in libraries and the academy more broadly). Interested readers should also see #LISOER on Twitter and this reflection by Molly Keener, who was in attendance. Clearly the yearning for ongoing community was not idiosyncratic to our meeting. As meeting organizers and participants, we experienced the same appreciation meaningful professional connection. We also observed a community that is clearly and impressively developing, populated by professionals keenly aware of each others’ skills and expertise, and eager to be part of a shared project to maintain and improve the systems through which we share scholarship. If you’re a member of this community, if you work on scholcomm topics in libraries, we’d love your input via this survey, which closes June 15, 2018. If you want to learn more about our project, reach out to any of us directly via email, Twitter, or one of the many conferences we’re presenting on this and related work.